That's what I like about Fred, always a positive attitude toward everything. What are the estimated costs for this reconstruction? Will the steel beams be made to look like wood beams so as to maintain the look of the original wooden construction? Wood grain contact paper. Nobody will know the difference. Looks like hefty, wide flange (16 inch) steel is spec'd. Careful not to wipe out the contact paper budget. The problem with that idea is that the glue does not last very long. It will start peeling and look awful. Why not just paint the steel a neutral color and be done with it? Just thrpw a couple rivets in the beam and about 4 layers of paint and it would look original. Heck, if you're going as far as making rivets why not get structural angle, 2" strip steel and make our own lattice beams. Those would be consistent with the time period. (ok folks just kidding) But seriously, why not just have our crew of master carpenters just miter pine board and box the steel in. One could also run electric down the open channels and have outlets at floor level. Nice and neat and out of sight. They now make laminated wood beams, very strong, cheaper?, got to be way easier to hang. Why not use those? Who'll notice? The steel beams being installed will match the ones holding up the shop extension on the south side of the building. To my recollection, no one has ever commented on their appearance. Work continues on the shop building. We have decided to get a complete concrete footer under the wall between bay 3 and the machine shop. The entire wall sits on a mudsill that will be inaccessible once the concrete floor goes in the shop building. 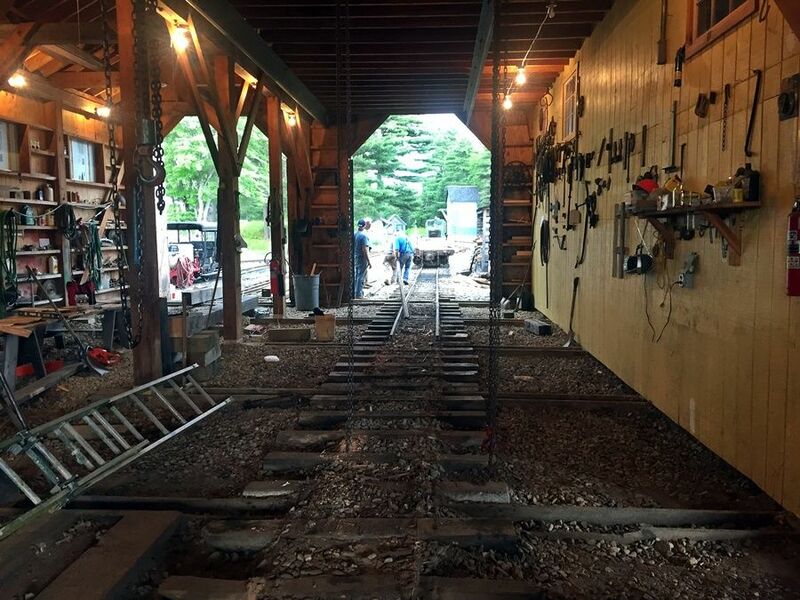 The track was removed from bay 2 today and work started on temporary support posts between bays 2 and 3 so footers can be poured under the posts that will support the new steel ibeams. See what happens when ya start out to scrap a couple pieces of bad wood and reinforce the place? Same thing when I start working on my 1967 abode. Really love the pics. Da more da merrier. Out of curiosity, since the rails have been removed, how have the concrete ties held up? Replacement of the mud sills is interesting. 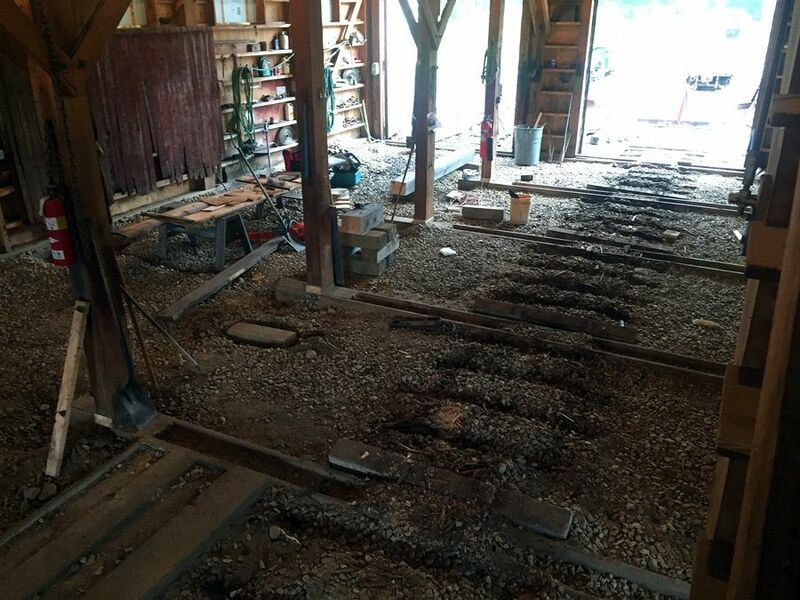 The Friends of the East Broad Top have been undertaking similar work on the main shops building at Rockhill Furnace. As far as I know, the original mud sills were laid down when the shops were rebuilt following a major fire in the late 1880's. So they were in the ground for well over 100 years. I guess the size of the logs used for the sills, as well as the species, had a lot to do with their longevity. The Friends have also had to cut off the bottom of some of the posts and splice new pieces in, due to rot. I don't know what type of wood they are using for the new mud sills. I think I would have gone with a concrete base for the posts!